The end of summer is approaching. As such, I find myself using certain ingredients over and over. Right now, I’m trying my best to keep and eat tomatoes until they aren’t fresh anymore. Likewise, tomato soup is featured on so many menus. However, a solid homemade recipe is a must. That’s because it’s about three things for me: caramelized roasted tomatoes, roasted garlic, and a good amount of fresh herbs. The cook time of this recipe is a bit longer than some. But there is not a lot of prep beyond chopping onions. 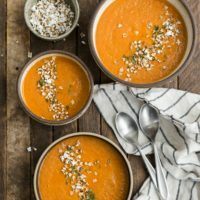 My favorite homemade rendition of the classic tomato soup. Roasted garlic adds an extra level of flavor sure to please everyone. Peel and roughly chop the onion. Place in a large roasting pan along with tomatoes. Drizzle with olive oil. Slice off the top of the head of garlic so that the cloves are exposed. Drizzle generously with olive oil. Then, wrap in parchment paper. Next, place the head of garlic on one side of the roasting pan. Roast the tomatoes, onion and garlic until the tomatoes are starting to brown and the garlic is tender, about 40 to 50 minutes. Remove from oven and let cool slightly. Once cool, spoon tomatoes and onions into a blender with the chickpeas, fresh herbs, salt, pepper, and 2 cups of the vegetable broth. Squeeze the cloves of garlic from the head and add to the blender. Puree until smooth. Transfer the soup into a pot and add more vegetable broth if a thinner consistency is desired. Bring to a boil. Heat a large pan over medium heat. Add the coconut oil followed by the sorghum. Cover and cook, shaking the pan frequently, until the sorghum has popped. Remove from heat. 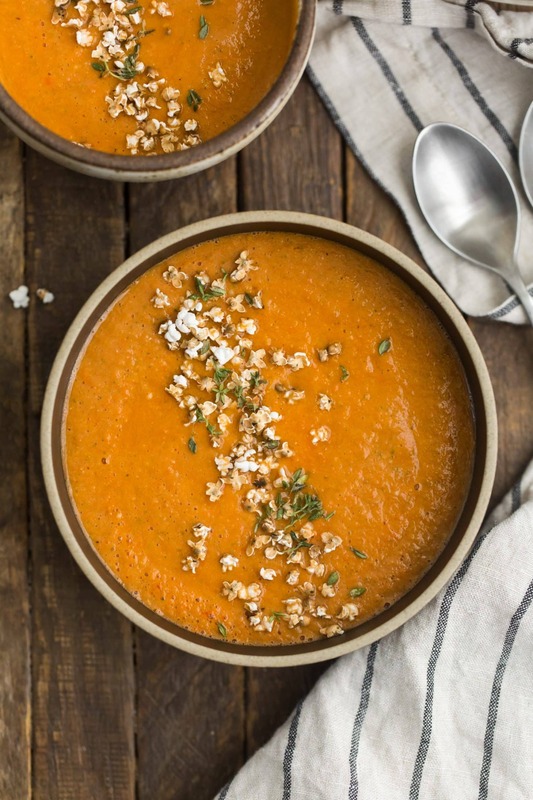 Divide the soup into bowls and sprinkle with the popped sorghum and fresh thyme. 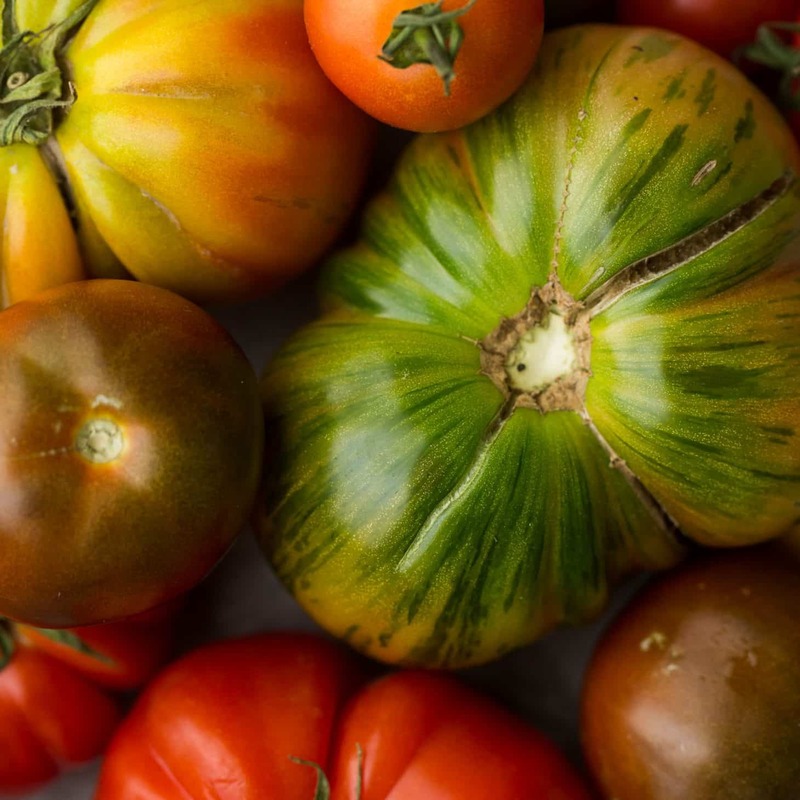 Tips & Tricks: I like my tomatoes to be on the caramelized side but you can always remove the tomatoes a bit earlier. Usually, I check them after 30 minutes. Don’t want to roast a whole head of garlic? Instead, roast your desired amount of peeled cloves with the tomatoes and onions. This soup is one of the few recipes I make as written because it’s just so good. However, there are a few things you could do to adjust this soup. Greens: Stir in greens at the end for a little extra color and bulk. For example, spinach, chard, and kale are all good options. Spinach will cook quickly in the soup. In contrast, roughly chopped kale and chard will stand out a bit more. Chunky: I prefer smoother tomato soup. But you could pulse the mixture instead of running the blender. As a result, the soup would be a bit chunkier. Grains: I love the popped sorghum because it provides a bit of texture. It’s also a fun twist. But if you don’t have sorghum, try a different grain. In fact, cooked quinoa or millet would be good toppings as well. Recipe originally posted on October 19th, 2011. Last updated on September 8th, 2016. Get the original recipe here. Roasted garlic and tomatoes. You’re gonna kill me. Two of my favorite things! I can’t believe I never thought of this. I’m making this as soon as it starts raining again and all I wanna do is curl up and eat soup. I can’t wait! Bookmarking this one! Looks so delicious! I love that you add garbanzos to soup! It makes them so creamy! mmmm, exactly what i need! This was great, easy and tasty! First time making tomato soup and it turned out wonderful. Thank you for this fun, yummy recipe. I know that this is an older post, but I just discovered you (on Pinterest). I look forward to making the soup – but, what I REALLY look forward to is more of your photography. It is beautiful and compelling, when so much of what I see is bland and/or sterile. I just finished making this recipe. It is the best tomato soup I have ever had-hands down. I didn’t make the croutons as listed in the recipe since we are eating sandwiches with the soup. I don’t care if it’s summer and a million degrees outside-this is a total hit at my house. My 3 year old and 18 month old are already on their second bowl! Thank you for this!!! yes- roast and then puree! I just found this recipe via Greatist on one of their lists for great ways to use chickpeas! 😀 I cooked way too many chickpeas a couple days ago and am frantically searching for ways to use them. I’m SO GLAD I found this! It looks wonderfully tasty. I think there is an error in the ingredients list. I don’t see tomatoes anywhere in there. I saw the first ingredient as cherry and that maybe it was supposed to be “sherry.” I didn’t realize you were talking about cherry tomatoes until I saw it in the instructions later on. Huh- I updated that quite some time ago but the changes must have gotten lost. Fixed again- thanks! tthis was one of the best soups i have evr tasted!! I wondered does it freeze well? i want to make looads and live off it lol ! This is an older recipe, one before I started using dried beans and thus, the instructions were for if using canned beans. I’ve updated the recipe to reflect but yes, you will want to use pre-cooked beans. Sorry for the slow response! I tend to shy away from using larger tomatoes primarily because of the water content. I do, however, love using roma or a tomato akin to that in soups. I just made your original version of this soup about two weeks ago and am interested to see the addition of the popped sorghum. When I made it I wanted something crunchy on top but didn’t feel like croutons so roasted the rest of the can of chickpeas- I can recommend it! This looks perfect for fall! I am so excited to make this. It looks the right balance of hearty, herby, and refreshing. I have some lovely goat cheese from the farmers’ market and this is just the thing for a rainy day!! Thank you! This looks absolutely delicious, Erin!!! I am making it some time in the next few weeks!! This looks so yummy. I’m so ready for fall! Made this the other night with some leftover tomatoes we needed to use up from the CSA, and it was fantastic! Might spice it up a bit more next time, but will absolutely be making again. I made this and your avocado/mozzarella/jalapeno grilled cheese sandwiches last night for dinner. My kids loved this soup! Thank you for this great recipe. 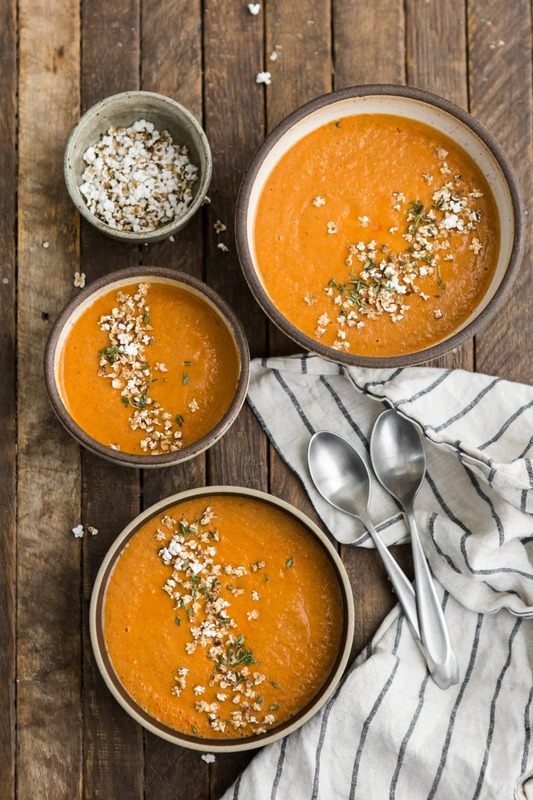 Yes, I’m still swimming in tomatoes, but a double batch of this soup (without the sorghum) in jars in the freezer is making winter more welcome. Delicious! Thank you. I was looking for a good tomato soup recipe to use up our hoards of cherry tomatoes from the garden for an upcoming soup exchange. I just finished making 10 batches and oh my goodness. I am SO happy I found this gem! I personally love the taste of garlic so I did 3 heads for every 2 batches. YUM! The rosemary really pops in this recipe. I’ll be keeping this one in my files for our next harvest! I was given this recipe by a friend 2 weeks ago and I have made it twice since. It is very delicious! I think next time I make it, I’ll try doubling the recipe so I have leftovers for a while. Thanks for sharing! I know this calls for cherry or grape tomatoes, but could I use any kind of tomato? I have a lot of larger varieties of tomatoes that need to be used. Yes- I would recommend straining out some of the liquid if they seem to release more juice though. You can always add it back in as you puree but I like the smaller tomatoes because there’s less juice. Tried the recipe. I enjoyed the roasted ingredients but the soup was a bit watery. Id suggest roasting tomatoes longer and not adding to much fluid (broth). I also didn’t have the seasonings fresh–could make a bit of a difference. Hey there! 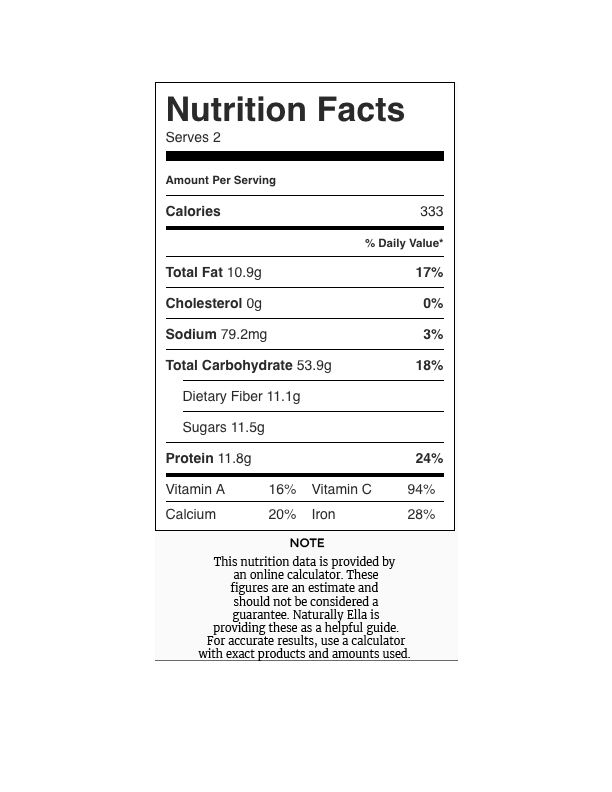 I was wondering are the calories listed above for a 1/4 of the whole recipe? Great soup, loved it! 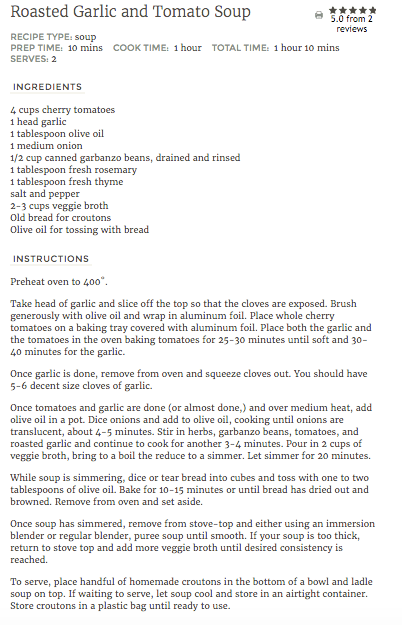 My wife has tomato soup for lunch every week, she’s going to love this recipe. She still talks about a tomato lobster brisk she ate at a restaurant in Chicago many years ago, I tasted it, it was deliciously decadent. This is a terrible recipe, very bland. Not at all what I expected. I had to add 10 oz of tomato paste to get some sort of flavor. I’m sorry to hear that- it seems strange as I’ve made his recipe numerous times. My only thought would be more salt. 10oz tomato paste seems like a lot compared the the ingredients.